Crossley 15.7hp sold at Manor Motor Company in 1935. Homepage. This page: An invoice made out for a car to its new Hornchurch-based owner, in the 1930s. 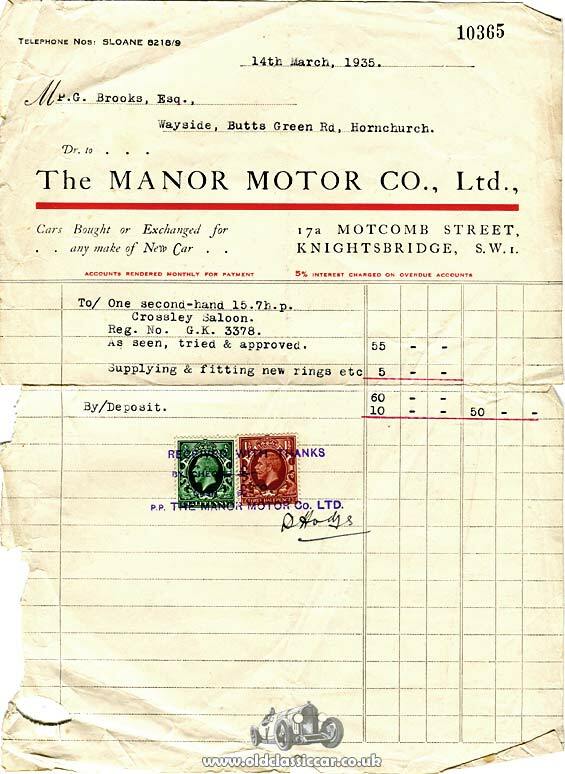 The Manor Motor Company was situated at 17a Motcomb Street, Knightsbridge, London SW1, at the date of this invoice - 14th March 1935. Although now the premises appear to be in use by a retail patisserie, evidently in the 1930s it was home to a selection of fine motor-cars, including a 15.7hp Crossley saloon car. The car in question, GK 3378, was first registered in the City towards the end of 1930. The 1990cc 15.7hp was introduced by the Manchester-based manufacturer in May of 1928. This six-cylinder machine, fitted with a four-speed gearbox as standard, was noticeably lighter than its predecessors and, as a result, could crack a respectable 75mph despite its modestly-sized engine. In 1930 a revamp of the range saw the car now named the Silver, boasting a number of useful updates to its specification. In this form it remained in production until 1934. The car referred to in the invoice below was registered late in 1930, so could well have been an example of the revised version. Despite being in use for just over four years, part of the deal included the fitment of new piston rings, for which an extra five pounds was charged. The buyer was a Mr. P.G. Brooks of Wayside, Butts Green Road, in Hornchurch. The road still exists, up and down which the Crossley would have motored, but if the house itself remains intact, it may well have been renamed. But what of The Manor Motor Co. Ltd - did it, or indeed the car, survive the war? The car was kept until November 1936, when it was part-exchanged against an 18hp MG at Cass's Motor Mart in London. More period items relating to old vehicles can be found in the Motoring Collectables section of the site. Another of Mr Brooks' purchases, this time in 1933 for a 1929 Riley at WJC Motors, is recorded by this original receipt from that year.